droppingsully | "It's about the music. Period." Alright Everyone! We are headed home to the place of our inception! Main Street Music Fest 2017 returns to Main Street, Ellicott City and so do we. 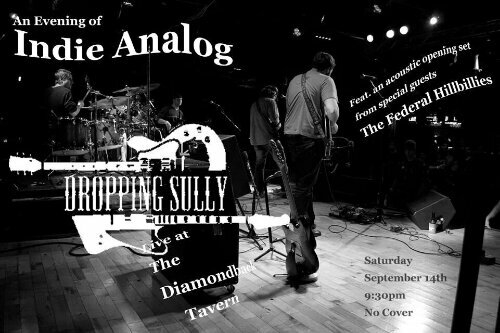 We will be bringing the classic ‘Trainwreck’ lineup of Dropping Sully featuring Andy Hall on lead guitar and vocals, Ryan Geraci on bass and vocals, Tommy Smith on drums and Chris Wojtal on rhythm guitar and vocals. If that wasn’t enough for you we are also bringing our good friends and piano impresario, Mark Quinn for the whole shebang! We will be playing at the Antwerpen Toyota Wine Bin Stage at 4:30pm at the fest! Can’t wait to get there and see all you crazy cats again! Come early and stay late! See you in a couple weeks! Check out our tunes on droppingsully.bandcamp.com! The groove is indie-disco and lyrically this song looks at the life of an outlaw trying to run away from his crime, but keep his family intact. It’s a cut from our first record Trainwreck, ‘Ruby’ was shot live at The 8×10 in Baltimore by McNair Video LLC. Thanks to Justin Rockett for the sonic engineering.